WORKERS AT MARKS & Spencer from the four stores the company has decided to close in the country, have voted overwhelmingly in favour of industrial action today. The workers from Dun Laoghaire, Mullingar, Naas and Tallaght stores, represented by Mandate, voted by a margin of 88 per cent in favour of action and the union had now issued a notice on the company. Mandate said the industrial action is will take place on or after 10 September. Speaking after the result was announced, the union’s general secretary, John Douglas said that it “clearly indicates the level of unity” within the workers who he described as being “very upset at the way the company intends to make them compulsorily redundant without any attempt to explore alternative options”. 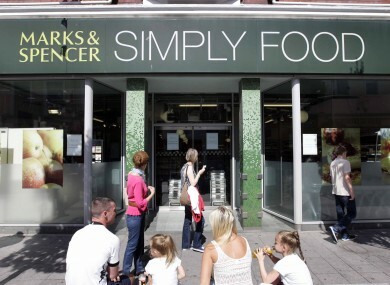 “We have registered our frustration and disappointment with the company whose actions have caused great anxiety for their workers, not only in these stores, but across the whole of Marks & Spencer’s stores in the Republic of Ireland,” he said. He added that the union was calling on management to show “goodwill” towards workers and explore other avenues available, including possible redeployment to other stores. If the company does not agree to roll back on its plans, pickets will be placed on the four stores on or after 10 Setember and the union said it may involve other stores in the dispute at a later date. Email “Mandate workers at M&S vote in favour of industrial action”. Feedback on “Mandate workers at M&S vote in favour of industrial action”.